A quick word of explanation: I’ve got YouTube links to two versions of each race – highlights which I’ll talk about in the column, and the full race post. Unfortunately, something happened with my camera (not user error, surely!) so races 5 and 6 went undocumented. You’ll just have to rely on my captivating storytelling. Turns out my grid slot for the each track was last, then first. I jumped in the last kart slightly nervous but more excited to be racing again. The oval track started with a rolling start, two-by-two... just like NASCAR. I got a great start right off the line but had to slow down quite a bit for the first corner which allowed the few drivers I passed to get right back around me. I settled down towards the back and got driving and strategizing. After a few laps and a pass or two, some stuff went down ahead of me. The day of the race was beautiful, but it had rained about 6-8 inches in New Orleans in the previous few days. Someone went off in the exit of the final corner jostling with the kart next to him and threw water all over the track and the racing line. In the first corner, someone ahead of me got sideways and I had no grip at all to avoid him. Bang! Broadsided, and with a bruised rib. Actually, it still hurts as I’m writing more than a week later. This was by far my worst karting-related injury and one I hope never to repeat. You can actually see the camera drop after the accident... that was me wincing in pain (right foot hard down, of course). That brought out a full-course caution and an opportunity to gain some places back. My restart was so-so. The damp racing line took some getting used to so I didn’t make any passes, but I was able to settle right down behind the guys in front. Unfortunately a few laps later I got caught out again by someone who spun in turn 1. Some would say it was an unlucky race, some would say that I should have kept my head up and seen it coming. In true racing-driver style, I’m going with the former. The last lap is the final segment you see in the highlights... I almost had him! The guy ahead got loose in the final corner and I would have passed him for certain if I had another 50 feet. You can actually see me bunny-hopping, trying to get more acceleration off the final corner. Alas, to no avail. I came 10th, I believe; which was second from last. Ok, so not a good start. I was starting race 2 from pole though, so a good opportunity to make up some points. Then the start happened. You’ll notice my start was abysmal. Oversteer, understeer, and all kinds of steer that I was not hoping to have. That’s the downside of a randomly selected kart, and no practice. I settled down into 5th. After passing for 4th again, P5 came back at me. You’ll see in the footage that I lose out (again) and get dropped to sixth. For the love of Senna, DO NOT get your tires wet. I’m correcting for massive oversteer when I get dropped back to 6th and can’t do anything to fight it. Thankfully a hard 3-kart accident put the caution out and I had a chance to fight back on the restart. 4th got out in the water and spun in front of me. I caught a lot of the moisture he was dragging on track but thankfully I was able to avoid him this time - 4th place and another caution. The race ended with a green flag on lap 25 (the final lap) and I remained 4th. Overall, not too great on the oval especially considering that the oval was my best track in my previous two kart-a-paloozas. Oh well. We were back to turning right once-in-a-while on the rental track. Again, I was starting from the back in Race 3. Thinking we were doing a standing start, I was caught out way behind the kart in front on the start. Thankfully I had enough drive somehow to compete in the first corner. I made a bunch of passes on the first lap and was up to probably seventh or eighth before it settled down. After a few laps, I got in a pretty fun tussle with the karts behind. It took us almost full a lap to sort it out. One driver (we’ll call him Neon Shoes) nudged me exiting the final corner so he and the driver immediately behind (Green Helmet) got past going into turn 1. They had enough overspeed that I was able to make the undercut work and get right back by Neon Shoes. This is probably my second-proudest maneuver of my short racing career. It seems simple, but this is the first time I did it right, and on camera! I hung on the outside of Green Helmet through the next corner and had the inside line for the tight left-hander coming up. It looks like I nudged him off, but he turned into me so I’m happy with that pass. Next Neon came back at me. My next move was questionable as I had the racing line but he was slightly ahead. I kept the line and forced him off a bit... and got a rolled-black-flag warning. Oopsie daisy. Nonetheless, this move was my proudest because I thought I was in the right for keeping my line – let me know in the comments if I’m just a jerk. We pick the action back up on the final lap. I’m right behind fourth and fifth and not thinking I’m going to make it work. I was wrong. They traded paint in a few of the corners and slowed each other down. Fifth ran wide and didn’t have enough speed to come back at me. Then on the exit of the final corner fourth got oversteery and scrubbed off a ton of speed. Fourth through no fault of my own! Eleventh to fourth is one race I’m pretty happy with. Race 4 is the most boring one. I started on pole, and did my best Sebastian Vettel impression by staying there the whole race. My start was pretty clean, though third poked his nose in a bit. After that it was a matter of learning the kart and what was fast. During the first lap, I thought I had a dog of a kart. It just didn’t feel right. By that, I mean it didn’t feel like my last kart which I was used to. It was actually pretty well balanced. I found that out when I looked behind me after lap 1 expecting to see someone right on my bumper. Turns out I was a few kart-lengths ahead. After lap 2, the gap was even farther. I drove my line and didn’t have to deal with anybody else for the whole race. Not a fun story, but first place! The next cut of the highlights video is just what I think was my best lap. Any critique is appreciated. The final cut is the victory and a bit of fist pumping... no Vettel broken finger. Unfortunately, no race footage for this one. 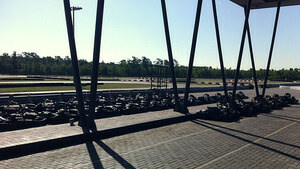 The track was longer than the last Kart-a-Palooza sprint track and a little bit easier to pass on. There was a long front straightaway, a fairly slow corner followed by a flat-out chicane and another long straight. The second section was two hairpins, two chicanes and a final 130-degree or so left hander back onto the main straight. Again, I started 11th and had some passing to do. This time we did start from a stand-still. I got a good getaway, and made two passes straight away. Turn 1 of lap 2, I made a terrible pass on eighth and felt too guilty about it so I let him back by. Unfortunately, the guy behind came with him so I was put back to tenth, and had lots of ground to make up. That’s what you get for being nice! After some cooling off and a bit more diagnosis of how far I could push the kart before it oversteered me off into a mud bog, I got back to the task of overtaking. The field was pretty spread out by this point, so there weren’t many people in my crosshairs. I set my sights on P10 and got moving. After passing tenth in the twisty back-section of the track there was quite some distance to make up on ninth. I eventually caught up to ninth with a few laps to go. You wouldn’t think it, but you actually can draft in a go-kart and it has some pretty significant effects. The other cool thing is that you can feel the air stop blowing on you when you’re right behind someone else... it’s the same feeling as when you’re on a boat or a bike and you’re going exactly the same speed and direction as the wind. Very cool. All this was a long way of saying; I drafted ninth for the main straight and tried to put a move on him at turn 1. It didn’t work out so I fell back in behind and did the same into the hairpin off the back-straight. It worked this time! With a lap and a half left to go, there wasn’t much I could do to catch up to eighth, so I set to work keeping the others behind me and resigned myself to ninth. Not a fantastic race, but at least ahead of where I started. If I could do it again, I’d make sure to assert myself early so the pack didn’t get so stretched out in front of me that I couldn’t catch up. I also wouldn’t have given that place back. Lesson learned, I suppose. Starting pole again turned out to be pretty boring. I got a good enough start to stay ahead for the first seven laps or so. A famous Jedi once said “Your overconfidence is your weakness”. I thought this was going to work out just like my second rental track race. I eased off a bit and tried to bring it home safely, and that was definitely the wrong decision. Right around lap seven or eight and completely unexpected, I got a bump from behind exiting the final corner. Crap! Second place managed to put the same move on me that I did in the race right before. Drafting down the back-stretch and taking the inside line for the hairpin. I unfortunately couldn’t make the undercut back and lost the position. After that demoralizing pass, third did essentially the same thing. I thought “ok, take the defensive line into the hairpin” but truthfully, it felt so unnatural to sweep to entirely the opposite side of the track from the racing line that I didn’t commit to it enough. He still got the inside line on me and I got passed. The race ground on and I ended up third. A good result, but not what it could have been. I’m pretty upset about that one, actually. So yeah, that’s what a Kart-a-palooza is like from my perspective. We all went to the award ceremony, and I was absolutely certain I would not hear my name. As it turns out, I came third in the middle-weight class! I didn’t think it was possible due to the talent there and my inconsistent results, but there it was. I achieved my goal! No prizes for third place besides gloating (and a bruised rib), but I’m extremely pleased with the result. Seventh, fifth and third are my overall results so far... next time it’s got to be first.